The EMU trade balance widened to 15.1 billion euros in November from 13.5 billion euros in October. 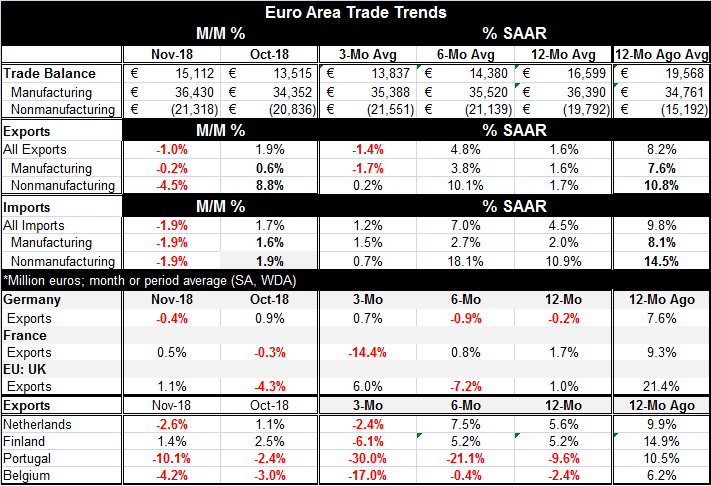 The November figure is above its three-month average (13.8 billion euros) but below its 12-month average (16.6 billion euros). While some focus on trade surplus reduction progress in the EMU, it is really all an illusion. We get to the underlying trends by segregating trade flows on both the export and import side into manufacturing and nonmanufacturing. On this basis, the November trade surplus widened for manufacturing to 36.4 billion euros from 34.4 billion euros in October and is above its three-month average of 35.4 billion euros and right on top of its 12-month average of 36.39 billion euros. For 12-month average over 12-month average, the surplus is larger. All the 'progress' on trade has come in the nonmanufacturing component where commodities play a large role and where the change in commodity prices like oil play a large role. This category is more prone to fluctuation and making sense of a trend can be difficult. Moreover, since the flows are nominal, even where there is a shift, it could be due to price rather than due to volume, an important thing to bear in mind with oil prices having been so erratic in the past few years. The EMU has a deficit in the nonmanufacturing trade. That deficit widened to 21.3 billion euros in November from 20.8 billion euros in October and 19.8 billion euros on a 12-month average. It is the deficit for nonmanufactures that is growing, but the surplus on manufactures is growing as well and the surplus on manufactures is still growing slightly slower and that has led to some overall surplus reduction compared to the 12-month average and compared to two years ago. However, the dynamics are still somewhat technical in nature. The manufacturing surplus is getting larger even though imports of manufactures are growing faster than exports of manufactures because the trade position is already in surplus. In order to contract the surplus in manufactures, imports have to grow much faster than exports and they have not gone over the required speed hurdle as of yet. However, nonmanufactured imports are growing much faster than their counterpart exports and that trade account is showing a widening deficit and progressing so fast that it is dominating the consolidated surplus, contracting that too. The country detail in the table reveals for the most part moderating export flows. Of the seven countries listed in the table, five show export declines over three months, four show export declines over six months, and three show export declines over 12 months. Germany, an export powerhouse, shows exports falling over both 12 months and six months and then advancing at a puny 0.7% annualized rate over three months. The strongest exports in the table come from Finland and the Netherlands on flows over six months and 12 months; both of these countries show export flows contracting over three-months. Is 'Free Trade' with China even theoretically possible? The Baltic dry goods index of international trade volumes shipped is still showing year-over-year declines. Recent data from China showed a sharp pullback in Chinese imports as its economy is slowing and the authorities there are pulling out the stops to try to generate growth again. But the trade war with the U.S. is having impact such as it is. Even without being escalated, U.S. trade policy is having an impact on China. The U.S. is dead set on getting a trade deal with China that will not just placate China for now but that will put trade on even footing for the foreseeable future; and that is going to be a tough task. It will be hard to check to see if China is enforcing arms-length trade since it is a communist country. It does have State Owned Enterprises (SOEs). And it directs the lending of banks in its system. Plus there are local authorities that will use their own decentralized powers and 'say so' to generate funds to firms locally if they think that is needed. Basically, China has an economic model that is wholly inconsistent with the very concept of free trade, as some people are starting to find out. As China growth slows, trade will slow for countries that trade with China. Germany has been adept at steering exports to fast-growing areas and German high quality auto exports were an important beneficiary of Chinese growth and burgeoning prosperity. But in the last year or so, as Xi Jinping, President of the People's Republic of China, began to lean against ostentatious displays of wealth, German exports have begun to soften. Now with China's growth falling off, clearly the situation has worsened. While the trade situation has worsened globally as the U.S. has put its foot down and demanded more trade openness and fairness, the impact on China has grown and produced a familiar response. China has become more bellicose and hostile in its foreign policy. It has threatened Taiwan and it is more aggressively pursuing and trying to enforce its claim on the South China Sea. It has warned the U.S. that if there is an incident in the South China Sea it will be the fault of the U.S. Canada has detained possibly for extradition at the request of the U.S. a Chinese citizen who is a corporate official of Huawei, a Chinese technology firm believed to have violated U.S. sanctions. China has retaliated by incarcerating several Canadian citizens and by overruling the verdict in one case involving a Canadian alleged to involve drugs changing the verdict to a death sentence. This is real life, not a movie. It is not clear if the Saudi killing of Khashoggi has emboldened China. Nor is it clear if China's South Sea grab emboldened Russia to grab islands claimed by both Russia and Japan and long under dispute. But there can be little doubt that geopolitical tensions are heating up. Russia also interdicted Ukrainian ships in the Black Sea headed for a Ukrainian port and holds its sailors captive. A U.S. citizen has been grabbed in Iran and accused of spying. Russia is under the pressure of U.S. and European sanctions and China is involved in a trade war with the U.S. There is no use pretending that these matters are not linked. However, all parties are talking. And that is a good thing. But there is yet a lot to talk about and a lot to decide on. And the situation with China and Huawei is more complicated than just a corporate official being detained. Separately, an employee of Huawei has been detained in Poland for spying. And While Huawei protests that it has never spied for China, it is China with its global reach and clear willingness to flout rules that others feel they must obey and its sway over Chinese firms that makes the West wary. With so much Russian and Chinse hacking going on, why would anyone attach the hardware of Chinese firm to their system especially after the additional spyware that some of it has been found to contain (here, here)? China can tout its 'belt and road program' but with actions like this its trade flows are doomed to be stunted even if restrictions are removed.